There’s a new kid on the block! Treat yourself at Black Oak Casuarina. 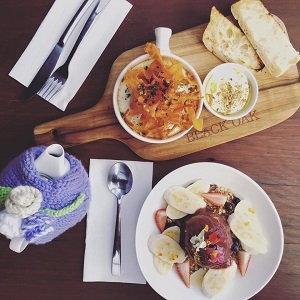 Drawing in visitors from The Tweed and Gold Coast, serving breakfast, lunch & dinner or just coffee and drinks this is definitely an unmissable dining experience while you are on the coast . This very successful new restaurant is really leaving its mark on the culinary circuit. The signature Fish Pie: with Snapper, scallops & prawns finished with and 8hr Soubise sauce, puff pastry and white truffle oil is served with seasonal steamed veg and is a seafood lover’s dream. But there is not just seafood – Grain Fed Eye Fillet or Confit of Pork Belly with salted apple caramel sauce and red cabbage, or of course dessert with Ginger and Rhubarb Crème Brulee. Breakfast Lunch or dinner this is not to be passed over. Just a short journey away Cabarita Beach Resort offers a convenient location where you can enjoy our luxury resort giving you a relaxing getaway and a wide range of apartment style accommodation to choose from, perfect for couples and families and bigger groups with apartments sleeping up to 9 guests. Our Cabarita Beach accommodation offers 2 & 3 Bedroom Apartments and 3 Bedroom Penthouses, as well as a 4 Bedroom Roof Top Apartment. As well as our bright and spacious luxury holiday apartments you can make your holiday that more special with our unbeatable guest facilities. It’s all here at The Beach Cabarita. Book with The Beach Cabarita today by visiting www.hisitedirect.com.au.